The Crato Formation is a geologic formation of Early Cretaceous (Aptian) age in northeastern Brazil's Araripe Basin. It is an important Lagerstätte (undisturbed fossil accumulation) for palaeontologists. The strata were laid down mostly during the early Aptian age, about 113 million years ago, in a shallow inland sea. At that time, the South Atlantic was opening up in a long narrow shallow sea. The Crato Formation earns the designation of Lagerstätte due to an exceedingly well preserved and diverse fossil faunal assemblage. Some 25 species of fossil fishes are often found with stomach contents preserved, enabling paleontologists to study predator-prey relationships in this ecosystem. There are also fine examples of pterosaurs, reptiles and amphibians, invertebrates (particularly insects), and plants. Even dinosaurs are represented: a new maniraptor was described in 1996. The unusual taphonomy of the site resulted in limestone accretions that formed nodules around dead organisms, preserving even soft parts of their anatomy. Fish fossils in the area were noted in 1823. When they were first methodically published, in 1993, the Crato Formation limestones provided a new site for pterosaurs, one that also preserved insects that fell into a brackish lagoon and semionotid fish preserved in phosphatized nodules. The fossils are usually compacted and preserved in layers of limestone. Fossil Odonata (dragonflies) and damselflies are especially rich in the Crato lagerstätte: currently 384 specimens have been recovered, 264 adults and 120 larvae. Hemiptera (true bugs) and Orthoptera (grasshoppers and crickets) are also abundant in number of species and in number of specimens. There are also plant remains. Local mining activities for cement and construction damage the sites. Trade in illegally collected fossils has sprung up in the last decade, driven by the remarkable state of preservation and beauty of these fossils and amounting to a considerable local industry. An urgent preservation program is being called for by paleontologists. In addition, the weathering of Crato and Santana Formation rocks has contributed soil conditions unlike elsewhere in the region. The Araripe manakin (Antilophia bokermanni) is a very rare bird that was discovered only in the late 20th century; it is not known from anywhere outside the characteristic forest that grows on the Chapada do Araripe soils formed ultimately from Crato and Santana Formation rocks. 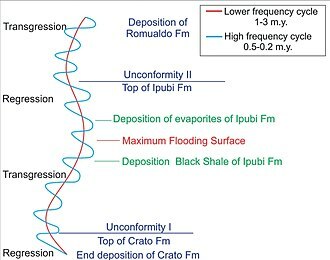 The Crato Formation has often historically been considered the lowest member of the Santana Formation (or, alternatively, the Araripina Formation) of the Araripe Group, later redefined as the Romualdo Formation of the Santana Group. 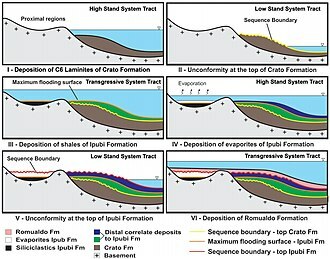 The Crato Member is the product of a single phase, where complicated sequence of sediment strata reflect changeable conditions in the opening sea. The age of this strata has been controversial, though most workers have agreed that it lies on or near the Aptian-Albian boundary, about 112 million years ago. The extent of the Crato unit and its relationship to the Romualdo Formation had long been ill defined. It was not until a 2007 volume on the unit by Martill, Bechly and Loveridge that the Crato Formation was given a formal type locality, and was formally made a distinct formation separate from the Santana, which is about 10 Ma younger. The Crato Formation is considered time equivalent with the Paracuru Formation. A basal member of the Tapejarinae. Araucaria cartellei, Brachyphyllum obesum, B. castilhoi, B. insigne, Iara iguassu, Caytoniales sp., Ephedra sp., Araripia florifera, Araucarites vulcanoi, Cariria orbiculiconiformis, Cearania heterophylla, Cratonia cotyledon, Endressinia brasiliana,Klitzchophyllites flabellatus, Novaolindia dubia, Pluricarpellatia peltata, Podozamites lanceolatus, Protananas lucenae, Ruffordia goeppertii, Tomaxellia biforme, Welwitschiaprisca austroamericana, Welwitschiophyllum brasiliense, Welwitschiostrobus murili, Araucariostrobus sp., Frenelopsis sp., Isoetites sp., Lindleycladus sp., Schizoneura sp.